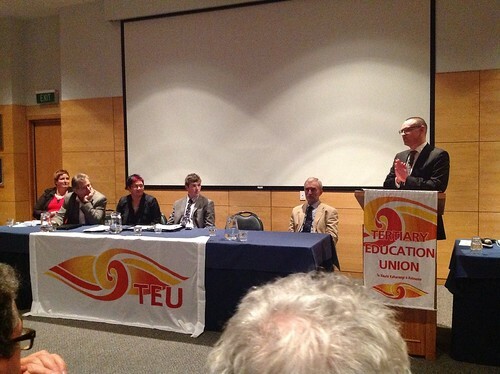 Last night the Tertiary Education Union hosted a public forum in Dunedin on the future of tertiary education. 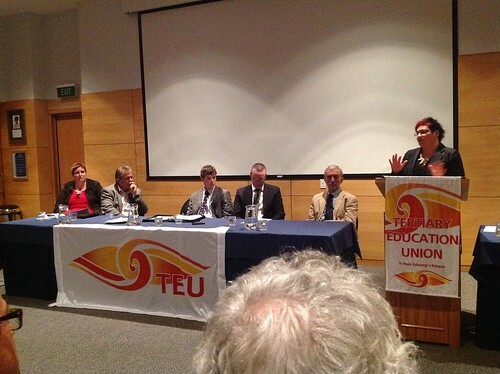 The speakers were Phil Ker, Prof Vernon Squire, Logan Edgar, David Clark, Metiria Turei and TEU’s Sandra Grey. As always Aaron Hawkins did a great job of chairing. 98 million new learners who will be expecting a tertiary education in the next few years with no reasonable expectation of getting it through traditional bricks and mortar education. There are also changing expectations of communities of their education providers. Phil points out that if only 5% of learners decided that they could teach themselves the impacts on education institutions would be major. He says that the current service chain is breaking up and we need to work out what is the new reality. (Phil talks more about these challenges in this recent Sustainable Lens radio interview). 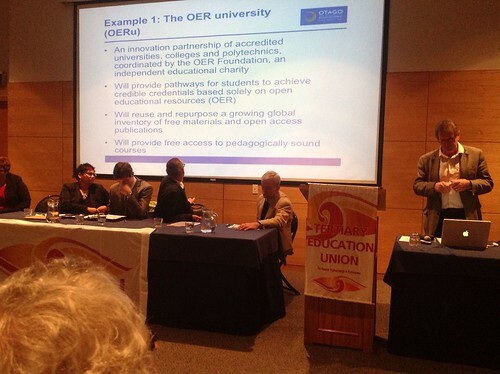 Responses include Open Education Resources and Work Based Learning. The key will be delivering through these alternative channels without losing quality. It is important that this extends beyond the resources to include quality interactions. The sinking lid in funding is reducing quality in education. While obvious to some, it isn’t to others so Squire presented lots of justification for this statement. He was particularly concerned about the effect of time constrained student allowances on post-graduate students. He said that internationalisation is not easy area to get into with every institution in the world fighting for international students. The key to the future is maintaining the collegial environment. Logan Edgar from OUSA talked about the importance of student culture. He might have said more but I didn’t write it down. Sorry Logan. A smart green and just community needs an educated community. She talked about the importance of maintaining accessibility to education – and the increasing barriers to that. It is key that education is seen as a committment to public good, not just individual benefit. Labour MP Dr David Clark stressed the importance of the role of the critic and conscience of society. This though is becoming blurred with engine room of economy as the lines between institutions become blurred. Clark says that singular focus on costs is a failure of vision in terms of economy and social development. He points to research that shows higher perception of debt barrier for people from lower socio-economic areas so the increasing user pays is worsening divides. With regard to a shift to online learning he says we can see as it as threat or opportunity. We need though, to change our thinking and get on with it. But, crucially, the experience must be a quality one. Dr Clark says education in New Zealand is fundamentally working. We achieve 4th on the PISA ranking from 20th funding. The role of government is largely not to stuff that up. Dr Sandra Grey gave an impassioned speech on “creativity, chaos and collaboration”. She admonished the government’s heavy-handed steering and its view of education solely as contributing to the economy. She criticised the approach of “picking winners”, particularly the focus on the STEM subjects to the detriment of the arts. The Government, she says, is ignoring the voice of professionals and communities. 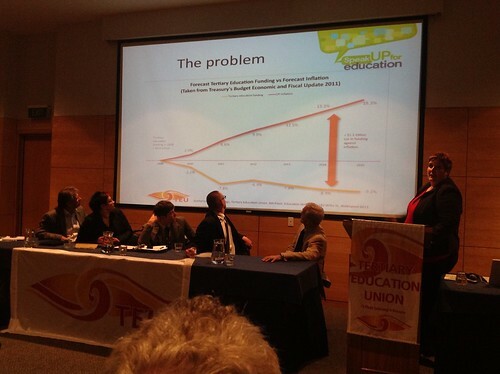 The real problem though is that the government’s tertiary education funding is declining. Dr Grey’s solution: move away from heavy-handed steering allowing chaos and creativity and encouraging collaboration. We need a new vision for education that is beyond economic only to value social, scientific and economic progress. With the notable absence of a representative from the government, no one took issue with the stance of the political or union speakers. Discussion then focussed largely on the challenges raised by Phil. Several questioners pointed out that education is more than a collection of TED talks. Phil responded that indeed it is the whole experience that matters. MIT and Harvard have moved from placing resources online to now including “learning journeys”. We need to be careful not to equate online with poor experience – the challenge is to ensure high quality total experience. He points out that “the reality is, a significant group will choose this mode, we have to prepare for that, without taking away from our excellent traditional offerings”. David Clark sees two risks – that politicians will see online as a cost saving option, and the looming possibility that people can undertake an MIT (say) qualification without leaving home – the outcome of both is that the sector will be gutted. He sees parallels in transformation within journalism. A questioner pointed out that corporate US moving back to campus model. There is an increased realisation that people need time for thinking not just producing. People on the panel reaffirmed the problem of shift to productivity as the driver – losing the “critic and conscience of society” role. Phil pointed out that done right, the world of work can be a sight of intellectual endeavour(and critical and creative development). There are, he reiterated, different constituencies, we need to adapt to different reality. The Work Based Learning paradigm meets both goals of productivity and intellectual development. We need to understand the various motivations of learners and respond with different mechanisms. I thought I would come to learn things, really learnt how to ask questions. How will I get this chaotic discourse online? Phil says the challenge is to deliver traditional values. 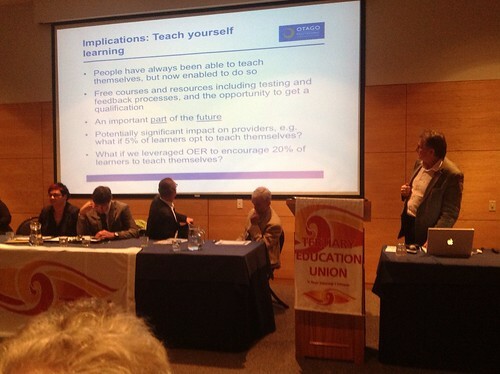 He says initiatives such as OERu bring back the traditions of education: high quality, free. A different experience – not a lesser one. To the question of who should decide role of universities and then who should pay for it? David Clark talked about the importance of the societal benefits of education. The shift to higher fees is undoing that collective responsibility. While previous generations understood that community responsibility, newer students, who have paid fees have an individualistic attitude of “its my degree I paid for it”. They have failed to recognise that even high fees are a fraction of the total cost of their education. He says anyone with the “privilege of tertiary education” has a responsibility to adopt the critic and conscience role, and to challenge, provoke, innovate on behalf of society. He proposes (only half joking I think) a reciprocal contract between students and society. Lastly Aaron asked about the Academic Spring. Phil responded with “bring on open-source journals as quickly as possible. It is an abomination that publicly funded research gets locked behind a paywall. The challenge Phil (and Sandra) say is recognise different forms of contribution: for example to find ways of making discussion such as tonight’s count. Vernon Squire said that “it is more complex than that” but unfortunately didn’t elaborate except to say we need to find ways to reimburse authors for open source publications. >Phil pointed out that done right, the world of work can be a sight of intellectual >endeavour(and critical and creative development). What sort of work are we talking about here? Mid-level managers who can lock themselves away in a cosy office? Floor workers in a factory line? People working the checkout at New World? For most people study will take place outside of work.